What is Electromagnetic Radiation and how can it be Dangerous? There seems to be much question and uncertainty when it comes to electromagnetic fields (EMF) and how something that surrounds us that we don’t feel can be a danger. EMF is a naturally occurring field present with any device carrying an electrical current. That means anything you plug into your wall has an EMF surrounding it. 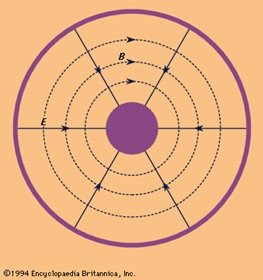 The picture below from Encyclopedia Brittanica shows how an electromagnetic field works. This picture is the view of the cross section of a wire carrying an electrical current, including its surrounding electromagnetic field. The purple center is the current carrying wire itself, and the dotted lines around the outside show the naturally occurring electromagnetic field that rotates around the wire. The ring nearest the wire, or the innermost dotted line, carries the strongest field, while the purple ring furthest away from the center indicates where the field fades to almost zero. This field is in constant motion, rotating around the outside of the wire. The rotational direction of the EMF depends on which direction the current is traveling. Using this picture as an example, if the current were traveling away from you (or into the screen), the EMF rotation is clockwise, and vice versa. The distance from the center of the wire to that zero EMF ring depends on the strength of the current traveling through the wire. Today’s laptops have many wires inside its body, carrying current to all the components requiring power. This current in the wire is ever increasing to meet the increasing demands of laptop performance, for better web browsing, streaming media, and demanding programs. Thus, as the required current increases, so too does the EMF surrounding the wire. When a laptop is placed directly on the lap, the body is effectively placed within the EMF rings surrounding the current carrying wires inside the casing of the computer. Researchers recommend limiting exposure to these fields to 2 milliGauss (mG), which is the unit of measurement of EMF. Laptops today have been measured as high as 175 mG when running daily tasks, like a virus scan or a disk defragmenting program. So there’s an electromagnetic field surrounding wires….how is that dangerous? When we plug in our laptops, the electricity we use from our walls is alternating current. That is, the direction of the current in the wire changes back and forth, and therefore, the EMF rotation goes from clockwise to counterclockwise, back to clockwise, and so on. This back and forth motion creates a vibration in the tissues of the body that are within reach of the EMF. The science of EMF and how it relates to current is a complex one, and the explanation listed above is a brief description of how EMF works and what it means to the average person using electronics on a regular basis.